Imerovigli, The outstanding view Santorini has a number of spots where one can take magnificent pictures of the unique scenery the island offers. But perhaps the most outstanding is one offered at Imerovigli, at the highest spot of the rim of the caldera (300 meters high). 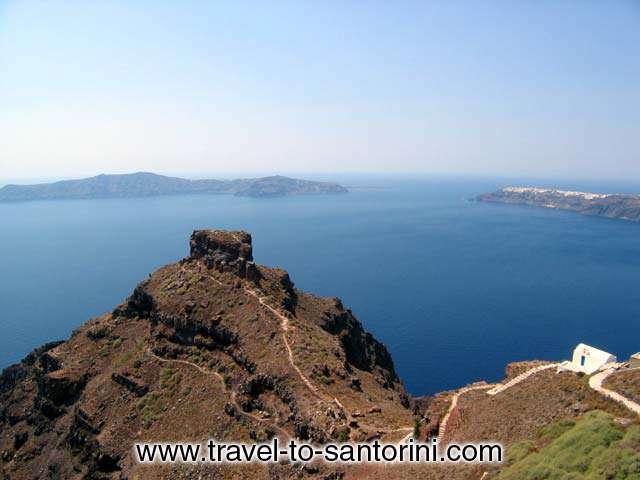 Imerovigli which means day watch, is near Fira and a place which should not be missed while on Santorini. The castle of Scaros is worth a visit. When Venetian leader Marko Sanouthos conquered the island in 1207, he raised the flag on the castle. It was at this point that Thira became known as Santorini (Santa Irene). The castle guarded the western entrance to the island from attacks. The castle had two portions, one called Rocka and the other where Roman nobles and Catholic bishops had their residence. The castle was never defeated during the 600 years of existence. Because of its proximity with Fira, it is connected with a public road or by the old path, offering a tremendous views as you walk along the rim. It's only a 20-minute walk and one that must be on your itinerary. Taverns, restaurants, bars, hotels and rooms to rent are plentiful in Imerovigli.